German Military Surplus Button Trouser Suspenders - Postwar / WWII - Used, Excellent Condition - Cotton Elastic, Genuine Leather, Steel - Fully Adjustable, One Size Fits Most - Vintage Army History Hi | BUDK.com - Knives & Swords At The Lowest Prices! Never underestimate how important well-fitting pants are in a war zone. Germany certainly knows it, as evidenced by these genuine military surplus trouser suspenders, issued to German troops shortly after World War II. Though postwar, they're very similar to those issued during WWII, with their leather button-hole end straps, premium German engineered cotton elastic bands, rugged metal clasps and - of course - cool vintage appeal you can only find in genuine military suspenders from this bygone era. The strap lengths and clasps are fully adjustable to fit most adults, and despite being decades old and worn by soldiers, these classic army green suspenders are in superb condition! The leather is supple and shiny, and the elastic still has ample spring, i.e. "stetchiness." A product of Germany's famously reliable manufacturing, you can bet these suspenders will last another 60+ years! Simply put, if they're good enough for soldiers in harrowing combat zones, rest assured they'll stand up to the worst you can dish out! 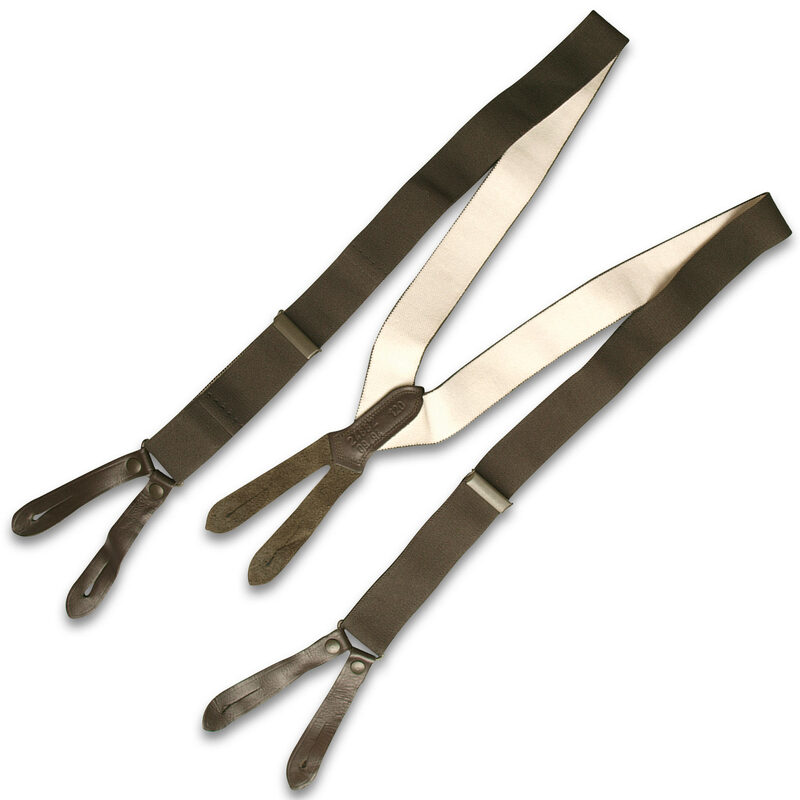 Keep you pants at attention, old-school German military style by donning these genuine army surplus suspenders! Hurry and get yours before these rare pieces of military history are gone forever! Supplies are extremely limited, and they're not making any more of these postwar relics! Accept no imitations or replicas - opt for genuine military grade. Order today!